Presented by Redpoppy Ladies' Percussion Ensemble Co., Ltd. The Redpoppy Ladies' Percussion Ensemble. Photo by Redpoppy. BOTTOM LINE: The hero of China is a peasant girl. In this non-verbal retelling of the war hero Mulan, an all-female percussion group ennobles her story with powerful sounds. If you remember the Disney version of Mulan, you will remember the faint accent of drums during the scenes’ transitions. The boom kat kat boom of the traditional Chinese drums set emotional tones of excitement, fear, and glory which gave me a clear understanding of the story’s arc. 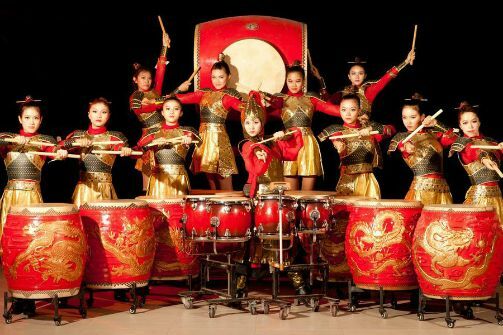 In the same vein, Redpoppy Ladies’ Percussion production of Mulan the Musical primarily uses the pulsating kick of the drums to herald a national story, demanding we understand it through our senses versus our logic. The Redpoppy Ladies’ Percussion Ensemble Co., has a considerably involved production history, including their performances at three Olympic games. And with this production, Redpoppy seems to have revitalized the drum’s range. The show begins with a lone woman upstage setting an atmosphere: she plays a multiple drum piece with two sticks, playing faster and faster until the projection screen behind her changes. The story then transports us through Mulan’s life by explaining Chinese tradition: chores, school rituals, childhood expectations. In each vignette of Mulan’s life the drum play mirrors the emotion. In a scene depicting school, Mulan and her friends “battle” drum in competition, showing off their skills, but then the competition melts into cooperation as they create the same sound. This is the arc of most of the fantastic drum numbers and each time you can see joyful head nodding in the audience. The first half of Mulan’s life is trivialized by her routine -- taking care of family, being a student, washing clothes -- and the production does suffer a bit because these scenes happen so frequently after each other. That isn’t to say their inclusion of Chinese culture, like in the case of “Wedding Drums,” a somewhat random scene about traditional weddings, isn’t also fun. Unexpectedly “Wedding Drums” included the audience by encouraging us to clap and even picking an audience member to be the groom’s bride. (In my show the bride was a man; it was pretty hilarious, I have to admit.) There are many moments throughout the piece like this where the Redpoppy Ladies are not afraid to include comedy or satire. It speaks of their inherent wit and furthers how a drum can be used. The crisis-ridden second-half of the piece is very exciting. The drum vocabulary is low and intense; the sounds of war continuous and synchronized. Throughout the show it rarely matters that the Ladies are women, or Chinese women. However, in the training scenes and actual war scenes in the piece I was struck by the political and social statement they were making. With the lack of gender equality we see in China -- and which we were recently reminded of here on our own soil -- to see an all-female cast not only portray men, but play powerful instruments as well is an eyebrow-raising moment. It was as if the percussionists were playing this story even louder because it’s so special. And maybe the women are becoming new Mulans in their own rights. Either way, this production casts a spell through the auditory joy of its drums and the exquisite talent of its members. Both funny and touching, insightful and understood, Redpoppy Ladies’ Percussion production of Mulan is a show to see.